AUDIO: Mark Levin On Broward County PSA Asking Citizen's Not to Riot: Is This America? AUDIO: Mark Levin On Broward County PSA Asking Citizen’s Not to Riot: Is This America? The Broward County Sheriff’s Office released a PSA asking people not to riot after Zimmerman verdict. This is the height of absurd enabling. It’s one thing to prepare for possible unrest, but quite another to plead with citizens to behave responsibly. Rush Limbaugh (in this short 46-second clip) compares the request of “Don’t Riot” being akin to telling someone “don’t think pink,”—the request alone is enough to make you think of it. Mark Levin offers a great rant on the topic as well and asks if this is still America? He makes a multitude of wonderful points. If there are any riots and deaths as a result of violence, the Liberal media should be held accountable. Here is a media montage calling for unrest and lamenting that the jury may find an innocent man as actually innocent. Liberal groups (inspired by the media hysteria) have been posting Facebook pages promising to riot and to kill George Zimmerman. WeaselZippers reports that there is also a brand of clothing calling for the murder of George Zimmerman. PIERS MORGAN: If George Zimmerman is acquitted, completely acquitted, not found guilty of second-degree murder, no lesser charge of manslaughter, and walks free, having killed somebody we know after the event was an unarmed young teenager, there is a concern that this will create a lot of ill feeling, particularly in the black community around America. There may possibly be riots. You will have read the same warnings about this. How concerned are you about that and about the safety of your client should he be declared an innocent man? MSNBC’s Liberal Loon and race-baiter Dyson is screaming to the audience that the ‘Zimmermans of the world’ get away with killing children. For the record, age and race do not guarantee innocence. Trayvon was not a child, he had a history of aggressive behavior, drugs, and vandalism. 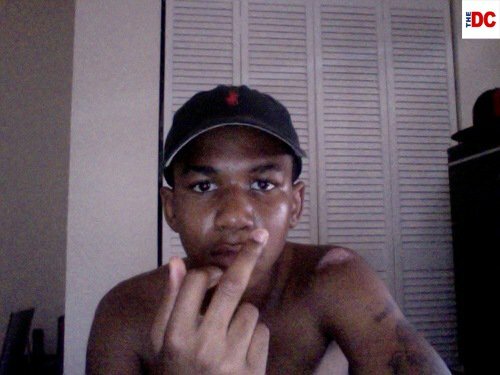 Plain and simple, Trayvon had issues. A different set of photos features Tracy Martin speaking at a press conference after his son’s death. In the first photo, a tattoo on the side of his neck spelling an undefinable term is readily apparent. A photo taken sometime later, though, reveals that this has been replaced with another tattoo. Rather than a word, two hands clasped in traditional prayer pose are present. “Here is what happens after the media consultant tells you the financial reward can be better if you improve your image,” Sundance writes. Hopefully the jury will return an innocent verdict for Zimmerman and let truth and justice prevail.